Although the evolution of the Air Brake System for heavy vehicles involved a number of “refinements” over the years, the Bendix system as used in the Flxible Clippers retained its simplicity during the production of these coaches. Thus there are no “relay valves,” or even Spring Brakes, although the addition of the latter, being inexpensive and easy to do, provides an extra margin of safey that is undeniable. If your coach has not yet had this vital improvement added, it should be done before you go anywhere. 1. The Compressor – this is the heart of the system. Mounted on the engine, it is driven from the engine’s accessory drive – by a belt or gears, and provides the compressed air necessary to operate the system. The compressor is lubricated by pressurized oil fed by a line from the engine’s oil gallery, which drains back into the oilpan through a drain line provided for this purpose. 2. The Pressure Regulator – this essential part of the system is mounted on the compressor. It senses the system pressure, and engages or disengages the compressor’s function by temporarily disabling the valving. It engages the compressor when the system pressure reaches a lower limit – about 80 psi – and disengages it at the upper limit – about 120 psi. The system reaching more than the upper limit could result in serious damage to equipment and possibly personnel. When the compressor is rendered “non-operational” by the regulator, it is still engaged and turning; it just doesn’t add to the system pressure until re-activated. 3. The Reservoir – this consists of a pair of air tanks – the first in line designated the “wet” tank, the next the “dry” tank. The “wet” tank provides, as well as air storage, a place for accumulation of the condensation of water produced by the compression and subsequent cooling of the air from the compressor, as well as for the inevitable addition of some oil which gets past the latter’s piston rings. This tank must be drained of its accumulated water/oil every day of operation. There is a drain valve provided on the bottom of the tank for this purpose. Your dual-tank reservoir system is located under the coach just ahead of the left rear wheel. Condensation water tends to develop especially in cold conditions – and it can make for real problems in freezing conditions! 3. (b) The “Blow-Off” Valve – As well as too little pressure, a danger exists from the development of Too Much pressure. Thus the installation of this spring-loaded check valve, mounted on the wet tank, designed to release excess pressure in the case of the regulator not cutting out when the maximum safe system pressure is reached – about 130 psi. In the case of a stuck (or frozen) regulator, severe system damage could otherwise result. In your monitoring of your dashboard gauge, you should also ensure that the pressure doesn’t build up over into the red zone. If the regulator is not cutting out, “fanning” the brake pedal until you can safely stop and check your regulator is a great idea! 4. The Lines – there is a system of lines and pipes connecting the various components together. In the Clippers, this was done with soft (bendable, or semi-rigid) copper tubing, although the modern applications use special air-brake spec plastic tubing and connectors. 6. The Front/Rear Differential Valve – This is a distribution valve, which regulates the relativity of the pressure being directed to the front and rear brakes. In slippery conditions, you want less braking on the front steering wheels than on the rears, since as the fronts approach “lock-up,” the steering goes away. For these conditions, the pressure differential may be adjusted from the driving position – it will be found located on the floor just ahead and to the right of the driver’s seat. (Below your right thigh.) Moving the lever toward the rear takes some of the pressure off the front brakes. In normal conditions (good traction), this lever should be toward the front, removing the slippery-conditions pressure bias. 7. The Brake Chambers – These are enclosed chambers which contain a rubber diaphragm backed by a steel disc connected to the push rod which actuates the brake in each wheel. Depressing the treadle valve directs air into these chambers, applying the brakes – providing of course that there is no excessive slack in the linkage. See below. 8. The Slack Adjusters – this is the name given to the levers which impart rotary movement through the cam shafts to the actuator cams inside the brake drums, which force the brake shoes outwards against the drums. These levers have a second function, that of providing a means of adjusting out the slack which develops on an hourly basis as the brakes are used. Slack Adjustment is accomplished by means of a worm-and-pinion setup between the lever and the camshaft – there is a bolthead provided for adjusting the worm gear around the pinion. In high-use conditions, such as mountain driving, they should be checked and adjusted on an hourly basis – that’s the reason for the brake-check areas found on most mountain highways. On the other hand, flatland driving, where the brakes are seldom used, will require less frequent adjustment. However, when in doubt……. 9. The Push Rods – these serve to impart movement from the brake chamber diaphragm to the slack adjusters. The pushrods too are adjustable – in length. This is because, during the life of the brake shoes, the angle of the pushrod to the slack adjuster (lever) at the point of brake contact will change as the shoes wear. The ideal angle of pushrod to lever is 90 degrees at this point – for the greatest possible mechanical advantage. As the shoes wear, this angle must be checked periodically, and adjusted as required. This is not a daily procedure, however, and should never be confused with slack adjustment! 10. Spring Brakes – There is no mechanical linkage from the driver’s position to the rear brakes. The Clippers were originally provided with a “drive-shaft” brake, controlled by a lever and mechanical linkage which imparts braking energy to the drive shaft. This system is not nearly as powerful as the air-operated rear brakes; indeed it is doubtful that it would suffice to stop the coach in the event of air failure at speed on a good hill – and it would of course be of no value in the event of a driveshaft failure. Enter the “Spring Brakes.” These provide parking and emergency brakes by means of exerting spring pressure to the rear brakes, through the pushrods and slack adjuster systems described above. 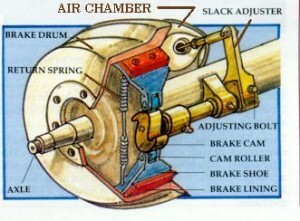 They incorporate an extra “spring chamber” which is “piggy-backed” to the regular rear brake chambers, but which contains a very powerful spring which applies the brakes at all times, unless defeated by a counter-operating air chamber which works against the spring to disengage it from the system. Thus the brakes are applied at all times, except when the spring brake chamber is pressurized. This pressure is applied through a valve accessible from the driving position – usually mounted on the dashboard. Until you have air pressure, the vehicle cannot be moved – a good idea from a safety standpoint. In the event of air pressure failure during operation, the brakes will be applied by the springs, giving an “automatic emergency brake” aspect to the operation. The spring brakes may be mechanically defeated by being “caged” mechanically – the chambers come supplied with special bolts which can be inserted into the front of the chamber and engaged with the diaphragm. There are nuts supplied with them as well, which may then be tightened down, pulling the bolt and diaphragm, forward, and thus disegaging the spring brakes. This is heavy work, and is best done when the brakes are already caged by air pressure, ie disengaged at the dash, but in the event of catastrophic air failure stopping the vehicle in an embarassing place, they may be mechanically caged so that it may be moved. in such event, be sure to block the wheels, and engage the mechanical driveshaft brake before de-activating the spring brakes! An additional caveat with spring brakes: NEVER attempt to dismantle a spring brake chamber without the proper jigs and tools! There is immense spring pressure which WILL cause you extreme damage if this advice is not heeded! 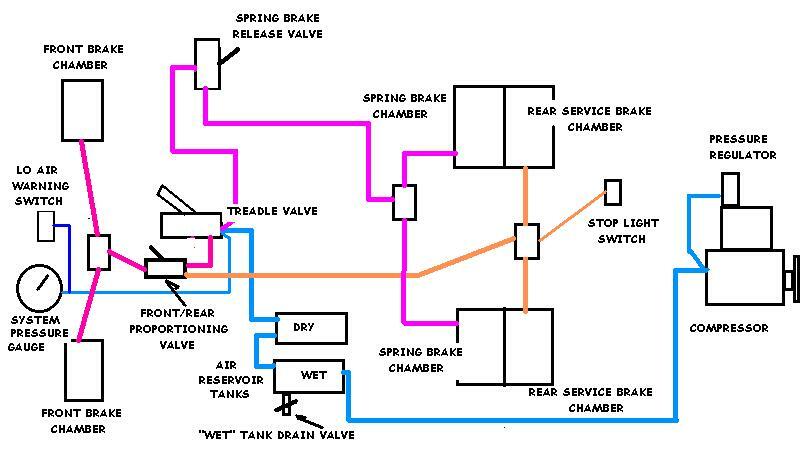 Spring Brake Chamber service is for experts only! A. The Dash-Mounted Pressure Gauge – this provides visual indication of the pressure of the system, and should be monitored at all times. Thus, if for example, there is a system malfunction and the pressure is dropping, your first indication will not be the locking up of the rear wheels as the spring brakes apply. Exceptionally slow recovery of pressure after brake application can give early warning of compresssor problems, leaks, slipping drive belt, etc., so that the driver can pull over and investigate before the situation exacerbates. If the regulator sticks – and this can happen, especially in freezing weather – the excessive pressure buildup will be indicated to the driver, who will pull over and shut down so that the situation can be corrected before disaster strikes. B. The Warning Light – In cases of driver inattention to the above, the warning light, and it’s companion listed next will serve to give “last call” notice. C. The Warning Buzzer – this is the Very Last Call before disaster strikes. During operation, things should never be allowed to get this bad! – the pressure gauge should be as much a part of your “regular checks” as oil pressure, temperature, speed, mirrors, and of course what’s happening out there in front. All of the above components of your Air Brake System should be checked regularly, and maintained in tip-top condition. The Stoplight Switch – located on the underside of the floor, just ahead of the rear axle, this switch is plumbed into the distribution tee which feeds the rear service brakes. When pressure is applied to the system, the switch closes, providing power to the stop lights. Some models have a “Stop” indicator lamp on the dash which signifies that this switch has done its job. Some models use this switch directly to operate the stoplights, others use it to energize a relay – mounted on the switch itself – which provides a higher-current capability to the stoplight circuit. See Wiring Schematic for connection details. The Low-Air Switch – This normally-closed switch is opened when the Air Pressure reaches the 60 psi range – that at which the brake system may be depended upon to operate. It is connected to the Low Air Light and the Low Air buzzer. A spring-loaded Defeat Switch is usually wired into the circuit, which may be held down at startup until the pressure builds up, to silence the buzzer. If you have to hold the switch down for more than 90 seconds, your system has problems and should be investigated. Stoplight Indicator Switch – Some models had a second stoplight switch mounted at the front, which closed when the system was pressured up to operate the “stoplight” indicator on the dash. Or to tell the driver that he had the brake pedal down. The use of such an indicator light is not clear to your writer – this is no positive indication that your stoplights are actually operating. One speculation is that, in the early days of the Clippers, the exceptional power of the air brakes required that the driver be aware of the possibility of surprising following vehicles, and the dash “Stop” light was a way of reminding him. Or her.